Our award-winning reusable glass water bottles enjoy descriptions such as the “clean side of green” and “art you can use.” As a company, we’re dedicated to building a company that’s good for your health, our planet all while creating a sustainable and successful company. This week, we joined the Green Chamber of the South, a nonprofit dedicated to the growth and success of sustainable business in the Southeast. 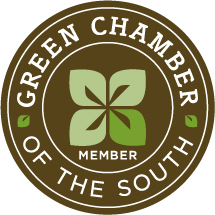 The Green Chamber of the South offers us the opportunity to connect with other like-minded businesses dedicated to building sustainable businesses in and around the Southeast. Founded in 2008 in Atlanta, Georgia, the organization supports the growth and success of sustainable business and encourages innovation and adoption of clean technology. It’s a non-profit organization working to make the Southeast the center of sustainable business in the United States. So how do we fit in this group? From the very beginning, our every effort – from design, to sourcing, to production, to packaging – has been focused on creating the lowest carbon footprint possible. The result? Our sturdy 22-ounce glass water bottle is 100% sourced in North America and has the lowest carbon footprint in the industry. Each bottle is created from recycled glass (up to 75% recycled and sourced on-site) using ancient techniques in a modern glass-making facility in Mexico. The bottles are enhanced by food-grade silicone caps and grippers made in Maine. BottlesUp’s bottles are free of known toxins including Bisphenol-A (BPA), phthalates, Polyvinyl Chloride (PVC), and polycarbonates that research has shown can compromise human health. There is zero plastic in the product or packaging. It takes more time to do it right, but we’re committed to living, breathing, and building a truly green company. We hope to learn, and to inspire, our fellow Green Chamber members for the betterment of health, environment and business. And if you’re a part of a company in the Southeast, considering joining the Green Chamber or even taking one small step to make your business greener – your employees, customers and business will benefit.